Check out the services we offer, think about which ones fit your needs, & contact us to get started! I&R is a gateway to our programs and community supports. You can inquire about disability related topics such as housing, transportation, governmental assistance, and more. Some questions can be answered quickly, such as an explanation of the circuit breaker program and assistance with completing the application. Other needs are more complex, such as appealing a decision for Social Security benefits. If the request is a service we offer, you will be assigned to an advocate and a case will be opened. If not, we will refer you to resources in the community. Contact our Information & Referral Advocate to get started. Amplified Phones Program - assists individuals who are hard of hearing to obtain free amplified phones through the ITAC program to increase communication and access. Assistive Technology and Braille Training - teaches the use of technology such as screen reading and magnification programs, assistive devices, and Braille reading skills. Independent Living Skills Training - teaches daily living skills such as: cooking, cleaning, laundry, budgeting, obtaining governmental benefits, accessing public transportation, accessing recreational opportunities, obtaining affordable health care and housing, and more. Older Blind Services – Seniors 55 and older with vision loss obtain and are trained on the use of adaptive devices to maintain their independence in and outside the home. Adult Employment Readiness - a twelve week class designed to aid consumers to find and keep a job. Topics include: assessing skills, interests, and career options; job search techniques, on and off-line; creating resumes, cover letters, and applications; interviewing techniques, employment rights, accommodations, and disclosing your disability; work habits and values; and financial literacy. Customized employment services are available to individuals as well. Youth Employment Readiness - an 18 week program held in LCCIL Mundelein office. Students learn how to obtain and keep a job, develop computer skills, and complete work-based learning opportunities to build office skills. They also study their disabilities and the accommodations that will help them be successful in the workplace. The program is held during the school day and transportation is provided by the school district. 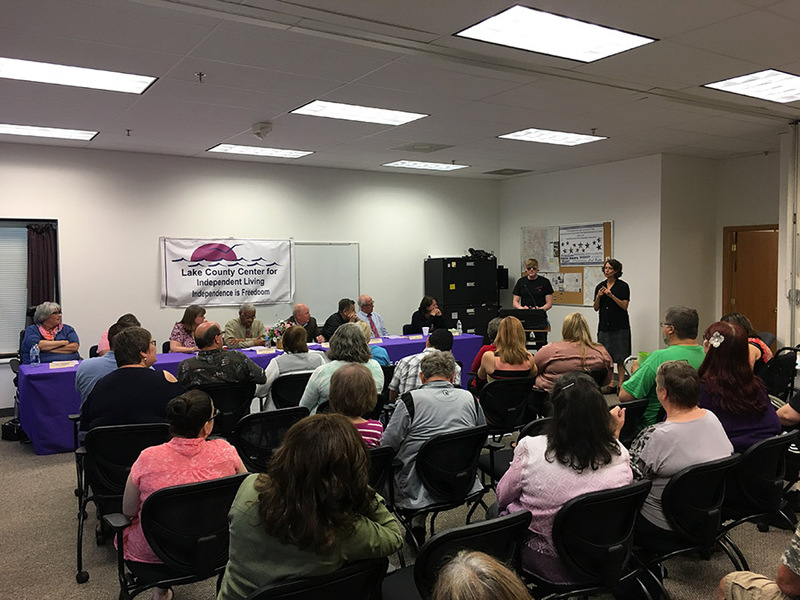 Centers for independent living must be able to identify with consumer needs; therefore, a minimum of 51% of board and staff must have disabilities. A mentoring relationship can develop between staff and consumer that enhance the provision of service. Further, we offer peer mentoring opportunities through various support groups. They provide safe space for discussion of personal feelings that are shared with those who can empathize and can offer support and first-hand experience. Heads Up - a support group for survivors of Traumatic Brain Injury and their care givers that meet at 7:00 pm on the fourth Tuesday of every month. Words of Wisdom (WOW) - a support group for any individual with any disability that meets on the second Wednesday of every month. Advocacy is integral to the inclusion of people with disabilities in society. We believe the public should learn about disabilities and the abilities of those who have them in order to promote acceptance. LCCIL also advocates for equal access and change in the community that promotes independent living. We utilize a grassroots, community organizing approach to advocacy initiatives, training and mobilizing leaders who are personally affected by the issues. Disability Awareness Presentations - presentations that educate the public about day to day activities and accommodations, provided by individuals having personal experience with disabilities. Individual and Systems Advocacy - advocating with the consumer to obtain their individual needs as well as activities that lead to systemic change to meet community needs. Leadership Development - training opportunities to develop leaders in the disability community to achieve social justice and meet community needs. Participants learn about the legislative process and techniques to influence decision makers to create change in their communities. Site Surveys - the assessment of physical accessibility of public and private facilities to ensure access for people with disabilities. Voyager Internship - a summer program in which youth receive leadership development training to address community issues, "hand on" employment skills training, project planning, and more. Community Reintegration Program - assists individuals, 59 and younger, to transition out of nursing homes, into their own homes in the community. Pre-Employment Transition Services - a 30-week program taught in schools to prepare youth for transition into adulthood. Topics include: job exploration, counseling in post-secondary education, workplace readiness training, and instruction in self-advocacy. Youth Transition Services - youth who have completed or are no longer enrolled in secondary education learn key concepts to prepare for success in adulthood. Topics include employment, independent living skills training, accessing community resources, financial literacy, access to public transportation, and more.